ICIS 2014 | ERCIS Competence Center "Service Science"
ICIS is the major annual meeting of the Association for Information Systems (AIS), which has over 4,000 members representing universities in over 95 countries worldwide. It is the most prestigious gathering of academics and practitioners in the IS discipline, and provides a forum for networking and sharing of latest ideas and highest calibre scientific work amongst the IS profession. Each year, over 1,000 IS academic professionals from around the world participate in the conference program, which includes about 60 sessions and 180 presentations, in addition to keynotes, CIO panels and research panels. 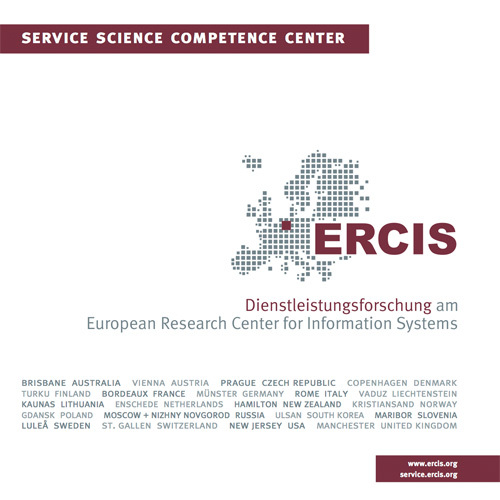 The ERCIS Service Science Competence Center supports the track Service Science and IS (http://icis2014.aisnet.org/index.php/submissions/tracks/18-service-scien...), in which Daniel Beverungen in involved as an associate editor.